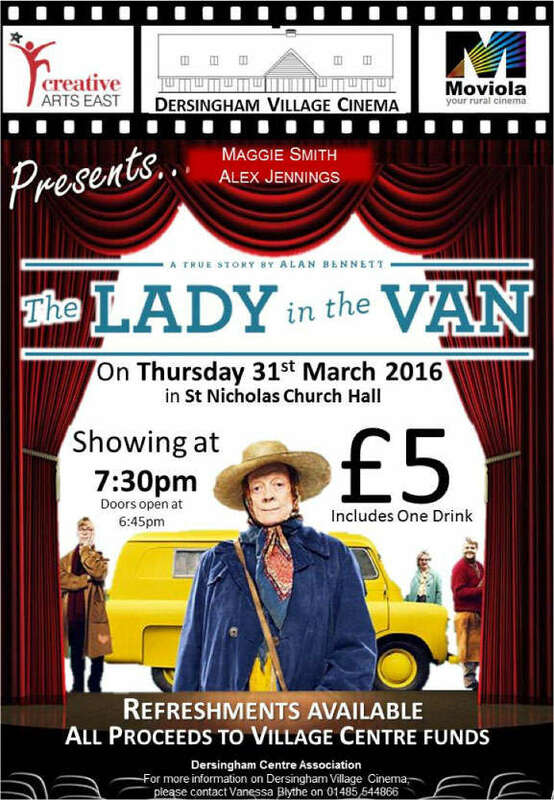 A not to be missed treat, this charming film is the real life (well more or less) story of how an itinerant travelling bag lady in an ancient van came to stay in the front garden of Alan Bennett’s house in a very well to do London suburb. As one would expect from Bennett the writing is superb as he depicts both her and his own life, often warts and all. It just goes to show that, if you are a kind and well meaning person as Alan Bennett obviously is, you can well, just get lumbered! As with all village cinema presentations, the show will take place in St Nicholas church hall, which in due course will hopefully be replaced by the new Village Centre. Funds raised from the cinema are divided between the Centre fund and the church, so you’ll be supporting good causes as well as having a good evening. 7.30pm on Thursday 31st March 2016. Don’t miss it!